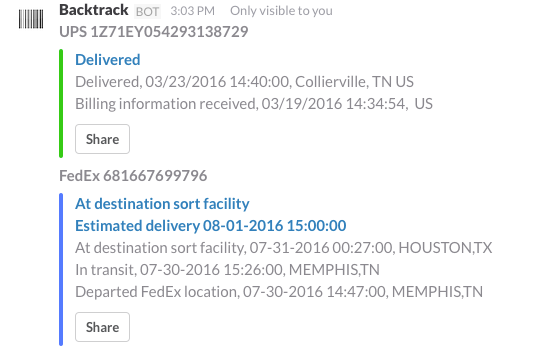 Track your FedEx, UPS and USPS deliveries from slack with Backtrack. 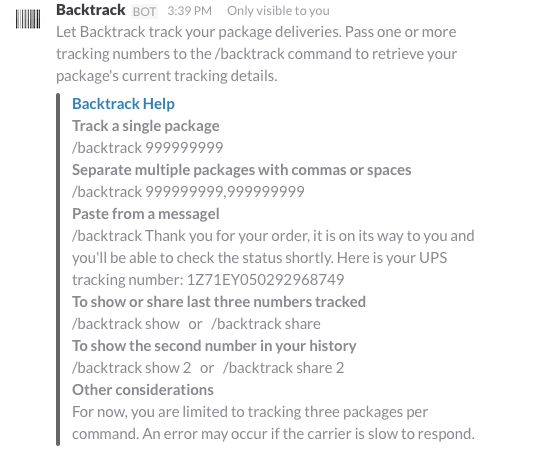 Backtrack is not created by, affiliated with, or supported by Slack Technologies, Inc.
Use the /backtrack command to identify one or more tracking numbers. Backtrack identifies the carrier for each of your tracking numbers. 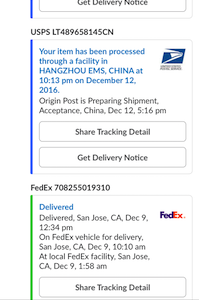 Backtrack then retrieves and displays tracking information for each located tracking number. Your results are safe. 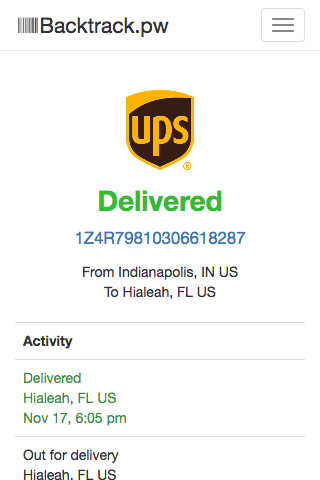 Only you see the tracking information for your tracking numbers. Select the tracking status to access carrier details in an easy to view layout. 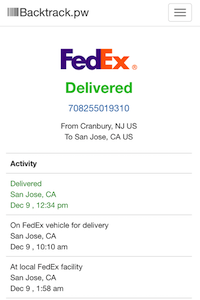 Navigate to the carrier tracking site by selecting the tracking number on the tracking view. By default your tracking results are only seen by you. Click the Share button to share tracking results with your team. 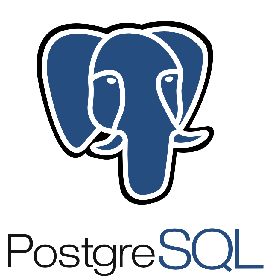 Use the 'share' subcommand to share previously tracked packages with the team. 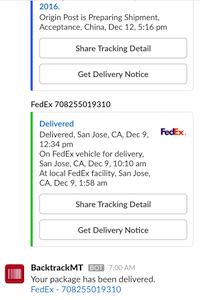 Backtrack will let you retrieve the latest tracking status for your last three tracking numbers. View the status of your last three tracking numbers. Using the 'show' subcommand retrieve a specific one of the three. Subcommand 'share' works the same as 'show', but will share your tracking status with the team. If you have a problem feel free to reach out to me at scott@wildidea.xyz. Here are some hints that might help. Tracking is limited to three packages per command. An error may occur if the carrier is slow to respond. Check Backtrack status at Status Cake. The Backtrack service uses Google Analytics for site and event tracking. Slack team and user ids along with oAuth tokens are collected and stored so that access may be verified. Shipment tracking numbers are collected for the purpose of identifying problems and to enhance the service. No data is shared with outside parties other than the site tracking data collected by Google Analytics. There's no warranty for this service. 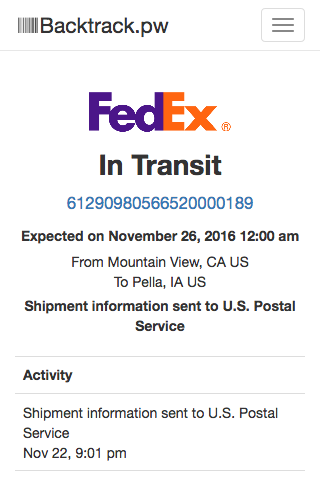 All tracking data is provided by shipment carriers. If you have a question or a suggestion, reach out to me on twitter @scottumsted or email me at scott@wildidea.xyz.